W.T. Stead's 1902 essay on the Warwick Trading Company. Urban's 1907 booklet advocating the use of the cinematograph by teachers, scientists, doctors and the military. Reproduction of the description from the 1912 Kinemacolor catalogue of With Our King and Queen Through India, Urban's famous set of films covering the 1911 Delhi Durbar. Photographs, posters, advertisements and postcards from across Charles Urban's career. The complete set of twenty-four Photochrom postcards based on Urban's 1915 propaganda film Britain Prepared. Extracts from Charles Urban's unfinished memoirs. In 1907 the Charles Urban Trading Company produced a fifty-six page booklet, The Cinematograph in Science, Education and Matters of State. The booklet eloquently sets out Urban's understanding of the cinematograph as something with a useful purpose. He calls for film to be released from the grip of the entertainers and to take up its natural role as a medium of instruction and illumination. He argues the case for the film in education, matters of state and science. In doing so he reveals novel ideas about the application of film to specific audiences, the use of film in medicine, the need for film archives, and includes what is probably the first English use of the word 'documentary' in a film sense. Former Cinematographic exhibitions of individual scientific subjects in places of amusement were intended as an introduction, and served their purpose in attracting and compelling the attention of scientists and experts. Possibilities, as demonstrated in the displays of three years ago, are now accomplished facts in prepared educational and scientific series of subjects. The entertainer has hitherto monopolised the Cinematograph for exhibition purposes, but movement in more serious directions has become imperative, and the object of this pamphlet is to prove that the Cinematograph must be recognised as a National Instrument by the Boards of Agriculture, Education, and Trade, by the War Council, Admiralty, Medical Associations, and every Institution of Training, Teaching, Demonstration and Research. 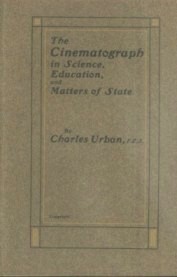 THE CINEMATOGRAPH IN SCIENCE, EDUCATION, AND MATTERS OF STATE, BY CHARLES URBAN, F.Z.S. The time has now arrived when the equipment of every hospital, scientific laboratory, technical institute, college and private and public school is as incomplete without its moving picture apparatus as it would be without its clinical instruments, test tubes, lathes, globes, or maps. This statement is endorsed by hundreds of teachers and heads of institutions in many countries, who now realise the educational possibilities and scientific usefulness of the animated picture camera. Forseeing the possibilities of cinematography as a powerful and revolutionising factor, the Charles Urban Trading Company, of London, Paris, Berlin, New York, Barcelona, and Manchester, has spared no expense in its scientific and educational departments during the past five years inequipping a qualified staff for exhaustive research, in the production of animated films which depict animal, insect, bird, fish, repitle, bacterioloigcal and other microscopic forms of life, and in the various manifestations, transformations and phenomena of nature. These results of the labours of trained and qualified scientific experts, improved upon and accumulated during this period, have now arrived at such a state of perfection that we are justified in calling atention to the various series which have been prepared. Our endeavour has been to produce life-motion pictures in sequences which give the work of text books without their dryness, and yet impart a knowledge which cannot be gained by mere reading. To the student whose attention becomes scattered by the conflicting claims of many works of partial scope and trustworthiness, a single series of accurate pictures is a great saving of time and labour, and our experts have spared no pains to make these animated subjects as complete as possible. By a full use of data they are treated with adequate knowledge, with originality and independence, and with a clearness and comprehensiveness which make them as easy to understand as the nature of the subjects allow. The perfected Cinematograph of to-day secures 1,920 pictures a minute, thus recording the very slightest motion of the demonstrator and his subject and the processes, magnified and projected with absolute accuracy, and with a sharpness unexcelled by any still photograph, are invaluable to students who have no opportunities of witnessing the actual demonstrations or phenomena. A picture taken at one speed of the camera can be projected at another, and, scientifically, this fact is of the utmost importance. The student needs no longer wait indefinitely for various manifestations of nature to occur. The picture record illustrating the growth of a plant, for instance, may occupy five or six weeks of the photographer’s time, but by the picture itself being projected at a high rate of speed, the phenomena are demonstrated as if the different stages of growth follow each other in the course of a few minutes, and this with scientific accuracy. The great importance of educating through the agency of the eye, as well as through the ear, is now fully acknowledged and established. To-day, in every properly conducted, up-to-date college or school, the optical lantern is in daily use for demonstrating by means of slides the subject of the lesson or lecture. The lantern slide, however, no matter how good, has in certain cases its limitations, particularly when illustrating various industries, native customs, animal, bird, or insect life, micro-organisms, etc., in so much that the slide can only show one pose, phase or position. It is for this reason, amonst many others, that the motion picture has such a future before it as an educational factor, for it is capable of showing upon the screen every movement in the most life-like manner. The leaders of science and education the world over are to-day advocating the use of the cinematograph as a means of vividly and truthfully demonstrating Natural Phenomena. The chief difficulty of the teacher is that of stimulating the imagination, especially, of the visualising eye we seldom conjure up with a sufficient degree of vividness details of scenes upon which we dwell. On the foundation of cinematograph pictures, imagination builds to right and left, and makes an effort to construct an edifice of as solid and visible material as that thrown upon the screen. The cinematograph enables the teacher to adapt his subject to the weakest member of his audience. As a rule, the others are grateful, for there are certain elementary conditions which must be taken into account when speaking to novices, which are worth considering even when we are dealing with those further advanced. The cinematograph helps the teacher to realise the difference between education and instruction. Education is a work of drawing out, rather than one of building in. It is the making of the best in a pupil by taking advantage of what is already there; to develop it, build upon it, improve upon it, and, as far as possible, make the pupil teach himself. Instruction is simply asking the audience to sit still while facts and laws are poured into the members; it is to look upon the pupil as a big receptacle into which fact after fact can be shovelled. Instruction is only a part - and a very small part - of education. The mind of the pupil is a living, thinking machine, and life and thought can best be brought into play by Cinematograph pictures which give every detail in motion of the subject under consideration. They enable the teacher to accommodate himself to the pupil. He must lead, not beckon, and aim at a mode of treatment which the pupil is able to follow. A series of living pictures imparts more knowledge, in far more interesting and effective manner, in five minutes, than does an oral lesson of an hour’s duration. The instructor can contrast the habits and customs of the natives of the country under discussion, the natural history, the social life, the means of communication, and so forth, with those with which the pupil is familiar, and do this in a manner both pleasant and of a lasting effect. The map, the model, the picture, the sketch, the blackboard, will give way in turn to this means of imparting information, which will be assimilated with a pleasure gratifying alike to the pupil and his instructor. In the study of Geography it is easy to see the immense variety of uses to be made of living pictures. By their means the teacher can in very truth carry his scholars round the world from China to Peru. Instead of learning dry, unmeaning facts, every lesson is linked on to a living representation of the country and the people to which the lesson applies. Cinematograph film subjects of present-day events: affairs of state, royal movements, naval and military demonstrations, with kindred functions and operations in peace and war, are all depicted as they are actually seen by the accurate and truthful eye of the camera, and the day has arrived when motion pictures of current events should be treasured as vital documents among the historical archives of our museums. Numbers of such subjects, which would have proved of inestimable value, are lost. They had their day on the entertainment and lecture platforms, but the firms producing them, being business corporations and not state departments, had none but commercial interests to consider, and the pictures were relegated to the limbo of the useless when they had served their turn. The march of improvement is so rapid that it is hardly possible to keep in touch. What was wonderful a few years ago is now a matter of course; but the doings of those few years will make valuable history nonetheless. For instance, where, in twenty years’ time, shall we find records of Booksellers’ Row? Where, even now, can we procure more than fugitive prints of old Seven Dials? The list can be indefinitely increased, by subjects which are of value even to the present generation, but how much more valuable will they be to the men and women of the future? Animated pictures of almost daily happenings, which possess no more than a passing interest now, will rank as matters of national importance to future students, and it behoves our public authorities, and the heads of museums, to see that the institutions under their control become possessed of these important moving records of present events. Books, pamphlets, prints, and the like, are perforce kept for reference, but films depicting important movements with a detail verbally impossible are lost to the nation for want of a little forethought and a ridiculously small expenditure of capital. Though many subjects illustrating past events are lost, it is reasonably certain that enough remain to make the securing of a film here and there a good investment for the future of our institutions. In the history class, with films as varied as a library of books, pupils need not read about historical scenes: they can see them actually in progress. All the advantages of a well-mounted historical play, or such pageants as those of Sherborne and Warwick, Jeanne d’Arc, the Passion Play, etc., can be placed at the disposition of every child in our public schools. Imagination has increased scope for exercise thereby, and the pictures give an endless vista in which it revels. With the assistance of special electric light installations, a knowledge of methods and processes of manufacture which were once sealed book is now, owing to the difficulties of cinematographing interiors having been overcome by us, within reach of everyone. In picture form, the veriest dunce is compelled to evince an interest in matters of everyday life. He is taught the mysteries of the printing press and shown how the daily paper is produced, from the growing pine tree of the Norwegian forest, through the stages of felling, transport, pulp and paper making, editorial rooms, composing, printing, etc., to the distribution and perusal of the journal. He is enlightened as to the methods employed in the construction of a railway, from the cutting of the first sod to the complete line, with its systems of junctions, tunnels, bridges, embankments and signals. He can see for himself how rolling-stock is made - engines, carriages, and trucks – from virgin ore, through the smelting, moulding, and casting processes to the general work of the fitter’s shop; until an express train, as he sees it thundering on at seventy miles an hour, becomes to him a living, almost sensate thing. In short, the whole world of industries is open to him, from the performance of the toilet of an ocean greyhound to the methods employed by the brickmaking rotifer. Both the French and the United States Governments have for some years preserved cinematographic records of naval and military doings, although the general public has had no knowledge of the fact. The National Library at Washington holds a film collection which is exceedingly large and varied. The subjects cover launchings of various types of government vessels, and all army and navy manoeuvres and war balloon experiments deemed essential to the purpose for which the system was adopted. Every subject, from the turning of the camera handle to the placing of the positive and negative in the official depository, is guarded with complete secrecy. Every piece of exposed film that does not reach the depository is effectively destroyed. These subjects are reserved solely for the use by the different branches of the government to which they apply. Secrecy is not always as essential to launchings as they are to military and other naval events; it is only when a vessel of warfare is launched without formal ceremonies that it is maintained; but the importance of the camera picture is the same in both instances. Two cameras at least are trained on the vessel to be launched, one covering a sweeping view of the vessel from the bow end, and the other from the stern; both cameras are located so that every movement attending the work is covered as much as it possibly can be, so that in case of accident the blame, if any, may be properly placed. In the equipment of a battleship as a means of recording fleet manoeuvres, firing tests, every day training, and every day observation, the Cinematograph should rank high in importance. With the military and naval branches the moving pictures are factors of extensive usefulness, and so long as the particular tactics to which they apply remain in vogue, the pictures retain their value to the government. This is demonstrated by the use to which the pictures are put at Fort Leavenworth, Kansas, where the military post graduate course is taken. Here the films, projecting machine and screen play a most important in demonstrating to the eye what the instructor or lecturer is endeavouring to inculcate regarding army manoeuvres. A military expert has stated that moving pictures are now considered almost indispensible to this branch. He knows of cases where repeated drills and lectures have failed effectively and clearly to drive home some important movement, while a single demonstration on the screen, with a few words from the lecturer, has had an instantaneous effect. Films can be preserved indefinitely in specially prepared receptacles. So treated, and projected after ten years, film subjects are found to be as fresh, reliable, and otherwise as good as a newly printed positive. The firm bearing my name has been authorised by the French Government to record trials of navigable and captive balloons, military engineering, manoeuvring and gunnery demonstrations; and it has also secured excellent gunnery records for our own Naval authorities. But the scope is capable of very great extension to every department of naval and military life. The authorities, recognising the advantages of the cinematograph as a powerful agent in recruiting, have, I believe, subsidised one or more of the caterers for public amusement who exhibit pictures of both services; but the question is of too great magnitude to be treated on these lines. Animated pictures, giving details of life on board ship in all periods of service from boy to man, with naval manoeuvres, pictures of fleets in foreign waters, etc., and of the soldier’s actual experiences in barracks, camp and cantonment, his amusements, recreations and advantages, would act more powerfully in recruiting for every arm of both Services than do any known methods of to-day. Fully equipped, with operator and lecturer - who would have authority to enroll recruits – a cinematograph exhibition could itinerate from John o’Groat’s to Land’s End with results undreamed of by the recruiting department with existing facilities. The importance of the Cinematograph in demonstration of cadet training, firing, and physical exercises is fully recognised by Field Marshal Earl Roberts, who encourages its adoption in every possible way, as a means of improving the soldier’s knowledge of his calling, and as an incentive to recruiting, and to volunteer efficiency. Perhaps this field is the most important of all. Surgical science is of no country, and pictures speak a universal language. One of the most important parts of the training of a doctor is the witnessing of operations. The Cinematograph now renders it possible to reproduce endlessly, under circumstances which permit of most close and leisurely study, scenes which formerly could only be witnessed in the operating theatres of our hospitals. A great surgeon performs a difficult operation with perfect success, and those who witness it cherish the memory of that exhibition of skill as long as they live; but what of the enormous multitudes who have no opportunities of seeing it? Even of those who were privileged, many would wish to see it again, if only to imprint more indelibly on their minds the way in which the work was done. Major surgical operations which occur but at long intervals are only seen in their entirety by perhaps half a dozen privileged surgeons who are near the operating table, and each of that half dozen is only able to concentrate his interest upon one phase of the operation – method, position, formation or growth under demonstration. It is impossible for him, under non-cinematographic conditions, to note all the proceedings, and he may never have another opportunity before a call in a similar direction is made upon his own proficiency. By means of the Cinematograph the situation is reversed. Rare, dificult, and delicate operations are reproduced for the enlightenment of students the world over. Six thousand - sixty thousand - can now witness these demonstrations of professional genius, however complex, not once, for a few minutes, when the mind cannot fix all the important points, but repeatedly, until every major detail is memorised. These rare major operations, which a student might wait years to see, are caught in every phase by the camera and held for reference at any time. While the object of the Cinematograph is to teach, it can never demonstrate the whole field of surgery, and it is therefore reserved for special procedures. In major operations, where every action of the operating surgeon is premeditated and precise, every detail and manoeuvre that is not indispensible is supressed, and only the more important parts of the operation are cinematographically necessary. The rest can better be demonstrated by fixed projections, photogaphs, or drawings. By use of the cinematograph, the student may study the methods of the greatest surgeons of all nations. Dr. Doyen (Paris) has for the past ten years applied cinematography to record rare and difficult surgical operations, and claims that by carefully watching the films it is possible to see where time – always of vast importance in major operations – can be saved. My reason for quoting solely from Dr. Doyen’s lectures is that his operations during the past eight years furnish the only successful demonstrations of the adoption of cinematography in operative surgery. In so doing, I venture to ask of the British and other schools of surgery an unbiased consideration of the subject. The cases I am prepared to submit will, I hold, conclusively prove the usefulness of this means of recording the major operations of our own surgeons. By arrangement with Dr. Doyen, from whom we have received the exclusive rights, we are now in a position to place before the surgical profession the cinematographic results of his labours. Particulars of his operative surgery, enumerated in special pamphlets for the consideration of the medical profession, with lists of films, instruments, and stereoscopic fixed slides, are now being prepared, and will be forwarded to any member of the medical profession on application. “The first time I brought to your notice the Cinematograph as a method of teaching and demonstrating the technique of operative surgery was at the meeting of the British Medical Association at Edinburgh in 1898. “Other demonstrations took place: in 1899 at Monaco, under the patronage of H.S.H. Prince Albert the First, and again the same year at the University of Kiel, by order of H.I.M. Emperor William the Second, and at the International Congress of Gynecology at Amsterdam; at the International Congress of the Medical Press at Paris, and at the Gynecological Society of London in 190; at the British Medical Association at Cheltenham in 1901; the Exhibition of Methods for the Advance of Medical Science at Berlin, where I was presented by the Committee with a gold medal for my new Cinematograph and its use in the teaching of operative surgery in 1902; and in the same year at the Polytechnic Museum at Moscow. These demonstrations, I say, have proved beyond doubt the value of this new method of teaching. “My first demonstration raised much criticism, but in spite of it I have continued to advance my project. “You will shortly be able to judge for yourselves whether animated photography is of assistance in the teaching of operative surgery. You will see how the Cinematograph fills up a gap that is noticeable in other methods of demonstration. “One example will suffice. The least understood of all my instruments is the ecraseur. You are about to see it used in operations that I am going to throw upon the screen. You will better understand the advantages and manipulation of this instrument in checking hemorrhage by glancing at the moving picture for a few moments than by the perusal of all the literature that I have published on the subject. You will see that the thickest pedicule is reduced almost without effort to the thickness of the fibro cellular tissues in a few seconds, these tissues alone resisting the enormous pressure of nearly 2,000 kilos. “You must notice, also, that many hundreds of people may follow the details of an abdominal hysteriotomy upon the screen of the Cinematograph, whereas only a handful can view the operation on the living subject, and the majority of these imperfectly. “It would appear from this that the Cinematograph would be of great value in the course on Operative Surgery that all the students should attend before entering the operating theatre. In this way, overcrowding of the ampitheatre would be avoided, and the would no longer hinder the surgeon without improving themselves, as is at present the case, since the majority see nothing, and those that do see have not sufficient knowledge to understand. “The Cinematograph will also allow of the preservation in documentary form of the operations of the older surgeons. How valuable it would be to see again to-day upon the screen the operations of Langenbeck the elder, of Maison-Neuve, of Volkmann, of Billroth, or of Péan. The documents that we shall have henceforth will, thanks to the Cinematograph, allow the surgeon of the future to judge better of the progress achieved. “Allow me to point out one of the peculiarities of the Cinematograph: to the surgeon who entrusts it with his operations it becomes a valuable master. It is thanks to this marvellous instrument that I have been able to improve my technique and eliminate all useless manipulations. “Operate simply: the operation will be short, and crowned with success. “Make haste, but do not hurry; and remember, to the patient, time is life. “The Cinematograph has enabled me also to justify myself against the criticism that I operate too quickly. You shall see for yourselves upon the screen whether my movements are in any way precipitate. “The explanation of my speed is to be found in the fact that everything is perfectly arranged and ordered, in simplicity and precision, and in reliance on method instead of leaving anything to chance. “Were tardiness the principal factor in success, I would say, ‘Take your time: go slowly.’ But it is entirely otherwise. A long operation exhausts the patient by laboured and futile manipulation which bruises the tissues and devitalises their repairing powers. “The Cinematograph is within everybody’s reach. To the professional man its management presents no difficulties. The one indispensible factor in the attainment of good results is the choice of a well-lighted operating theatre. “Commence with a typical case. You will at the worst risk the loss of 50 or 60 metres of film. As far as the patient is concerned there is no diminution in safety, for when about to operate under the eye of the Cinematograph your preparations will be made with exceptional care. In the teaching of midwifery and obstetric surgery the Cinematograph cannot fail to be of great assistance. The difficulty of making a student comprehend the various stages in the proper conduction of an ordinary labour is well known to all lecturers on the subject. Diagrams partially obviate the difficulty, but the Cinematograph would go far to make the lecture as instructive as if the labour were taking place simultaneously with it. Particularly would the moving pictures be of service in showing the management of the child at the outlet - manipulation of a breach, or twisted and prolapsed funis. For instruction in difficult labour it would be of still greater service, for very few men who have not done a special course of obstetrics at a lying-in hospital get an opportunity of seing more than one or two cases dealt wit. One is met at the outset by the paucity of material for demonstration. Even in a lying-in hospital such as the Rotunda, certain cases can only occur once in a number of years. What, therefore, could be of greater value than a collection of these living pictorial records, perhaps taking years in the acquisition, but capable of reproduction at the will of the obstetrician instead of at the caprice of chance? By means of the Cinematograph the important stages could be reproduced, and the student would have an opportunity of seeing the difficulty and its obviation by instrumentation or other interference. In this way a certain amount of confidence would be gained by the young practitioner, and much loss of life prevented. It is unnecessary here to enumerate the operations in which this method of instruction could be employed, and space will not permit. The great increase in the granting of licenses and certificates for vivisection under the Act of 1876 is now engaging attention, but whether this increase is justified by the advances made in medical science it is not the purpose of this pamphlet to discuss. The fact may, however, unhesitatingly be stated that very few medical scientists will for a moment countenance the infliction of unnecessary pain on animals. The controversy as to what is necessary and what unnecessary has always raged round the subject o demonstrations upon the living animal in the teaching of Physiology. The Professors maintain that such are necessary in order that the student may thoroughly grasp their significance, and that they may make the desired impression upon his mind. The medical profession have always expressed their willingness to adopt any method that will adequately take the place of experiments involving suffering to animals; and this, to my mind, has been their great justification in the course they have adopted. The demonstrations in operative surgery, mentioned in the earlier pages of this brochure, having conclusively proved the value of cinematography in cases of operations upon the human subject, the natural inference to be drawn is that its success in demonstrations upon living animals would not only prove of equal service, but would decrease vivisection experiments by at least ninety per cent. of their present number. This is an argument which should strongly appeal to all anti-vivisectionists, who acknowledge that “great evils are not destroyed by total abolition Bills, but are overthrown by successive ameliorative measures.” My contention, therefore, is that, by the institution of Cinematography in the vivisection laboratory, an “ameliorative measure” of the first importance would be introduced. What is to hinder the student in physiology classes from attaining his familiarity with certain experiments by means of the Cinematograph? His grasp of the experiment and its significance would be strengthened by such means, for the picture can be repeated any number of times until the veriest dullard be forced to mark, learn and inwardly digest. This method would be advantageous to all concerned: to the student, because of the opportunity of frequent repetition; to the professor, because there would be no fear of the experiment failing; and to the animal world, because one animal would serve instead of many. The student would gain in another way: Whereas, now, the experiments performed for his benefit upon the living subject are comparatively few and far between, by aid of the Cinematograph he would have the opportunity of seeing many of the historic and classical experiments that at present he can only read of. I am sure, could the question be put to the vote, the animal world would unanimously declare in favour of the sacrifice of one of their number under the perpetuating eye of the Cinematograph, rather than to the destruction of so many with no lasting result. Equal in importance in the study of microscopic forms of life is the Micro-Cinematograph, perfected by this Company. Utilised in conjunction with the Cinematograph Projector, germs and microbes, magnified to gigantic dimensions, are shown in full activity. The magnification varies from 2,000,000 to 76,000,000 times, according to the extent of magnification on the film, which varies from 25 to 850 diameters. This discovery was only achieved after much patient labour and no small expense. The chief trouble to be overcome was that of light. It was necessary to turn a ray of 2,000 candle power on to the speck that was being magnified and photographed, and yet not to destroy it by heat. In solving this problem a great scientific triumph of the highest value in many directions was accomplished, and there is no doubt as to the future of the Micro-Cinematograph in bacteriological science. As a result of this discovery, the scope of investigation into various diseases produced by bacilli is, by animated photography, immensely enlarged. Ordinary methods of preparing bacteria for microscopic examination give anything but an accurate idea of the natural appearance of the organisms. The greatest difficulty in the way of investigating living bacteria is the close affinity of their refractive index to the media in which they are cultivated. After months of experiment with various optical formulae, our scientific staff succeeded in finding a combination of lenses which permit accurate examination of living, unstained bacteria. By the usual methods, particular movements have to be waited for, often without success, as in the “clumping” of Typhoid bacilli; but, by the Micro-Cinematograph, pictures of these germs, magnified 850 diameters, may now be projected on to the screen in all stages of growth, and in restless, unceasing movement, while films presenting the necessary clumping can easily be prepared. In former years, only rapid nap-shot series for use with the Zoetrope were available, and only one person at a time could view the subject exhibited. But since the introduction of the Micro-Cinematograph the student of Natural Science may record the development of microscopic forms of life, follow it through the various stages, and demonstrate it to an audience of any size, with better scientific results. In the days of the Zoetrope, twenty feet of film could not be produced; now, film to any length may be procured. By Micro-Cinematographic investigation, series have been produced which illustrate circulation and rotation of protoplasm and the movement of chlorophyll bodies within the cells of the leaf of Elodea, the circulation of blood in the web of the frog’s foot, and in the tail of the goldfish. An accurate knowledge of these minute microscopic organisms is necessary, not only to the medical man, but to the Board of Agriculture, to every officer of public health, every sanitary inspector, sewage disposal committee, farmer, dairyman, brewer, etc. But for certain forms of bacteria the farmer could not successfully carry on his labours, while the diary farmer depends upon other forms of bacilli for the delicate flavor of his cheeses, etc., and the bacterial treatment of sewage is daily being more generally adopted as the best. Animated photographs of the different forms of bacilli and other microscopic organisms are now being produced by the Micro-Cinemaograph. In its application to the study of the life history of insects, the Cinematograph is of the first importance to the Board of Agriculture, to horticulturists, and to agriculturists. By its means are recorded, not only the transformations from the egg to the perfect stages of the insect’s existence, but also can be witnessed the manner in which, at different stages, it attacks crops. Great facility is given, too, by its means, to the study of the movements of insects and plants in relation to special adaptation and environment. The farmer, with the knowledge gained by a cinematographic study of his subject, is better able to cope with the depredations of the numerous insect foes which all too readily devour his small profits. Microscopic forms of life enter into so many branches of industry and commerce, that familiarity with their appearance is necessary to tea, coffee, and tobacco planters, fish breeders, silk merchants, and many others, and animated pictures of organisms affecting the various products will eagerly be sought. In the domain of Physics, Micro-Cinematograph records of the birth of crystals and the wonders of re-crystallisation have been made. The marvelous changing shapes of the high frequency discharge in electricity are also recorded; and demonstrations are given of the formation of smoke vortices and the throwing off of minute spheres or molecules from the wick of a spirit lamp upon which the rays of the electric arc are concentrated. The march of civilization is so rapidly effacing native customs, that it is of the greatest importance that Cinematographic means be adopted to place them on record. For this purpose the Cinematograph is an ideal agent, for by its aid we obtain a truthful and permanent record of native customs, ceremonies etc. In the study of movements and habits of animal and insect life, ordinary photography left much to be desired. Although a long series of photographs will present an animal in various positions, the one most characteristic is not obtained, and the point sought is missed. This particularly applies to the methods of carnivore in seeking and capturing prey. The ordinary snapshot camera fails entirely in its relation to wild animals in their natural environment when seeking and seizing food; nor does it give a graphic idea of the facial expressions and characteristic movements of the animal under observation. These difficulties have now been overcome, and it is possible to place before Natural History classes “living pictures” of animal and insect life which, by faithfully reproducing every action of the subject under discussion, more vividly impress the minds of the students than any lecture illustrated by still pictures or drawings. Upon all students of natural history the importance of using nothing but photographs as illustrations cannot be too strongly impressed. However carefully the artist may draw, and hoever skillfully the engraver may copy, there can never be the same accuracy of detail which it is possible to obtain in a photograph. The Cinematograph secures to natural history classes the opportunity of studying subject films in which the specimens – some of which are rapidly becoming extinct – are depicted moving amid their natural surroundings. The swimming fish, the flying bird, the leaping salmon, the crawling reptile and insect – these, as well as the larger animals, are reproduced faithfully. By means of the Cinematograph it is now possible to teach this subject, not as a study, but as a relaxation from study, and yet impart a knowledge hich cannot be gained by mere reading. “I have the pleasure to thank you, in the name of this Society, for the exhibitions of films of zoological studies shewn at out last scientific meeting. Work already done, and results recorded, show the necessity of close watching during the period of photographing phenomena. The Cinematograph has led to the observation and chronicling of what may be termed subsidiary phenomena which were heretofore unnoticed, and it is most useful in physiological botany, as showing the movement of plants between periods of activity and rest. Cinematography also teaches that the more we study by means of modern methods, the more the student is struck by the almost human-like instincts of the plants under observation. Photographs of a germinating seed may now be taken by the Cinematograph at regular intervals during many days, until the seed sends up its seed leaves. The projected pictures show the earth raised up by the swelling seed, and the seed-coat thrown off; the seed-leaves emerge, straighten themselves out, and then the first leaves breaks [sic] forth. Phenomena of plant life which take several days or weeks to record – such as the stages of growth in a plant and the opening of a flower bud – can be projected upon the screen, condensed to a single film, as if the successive stages followed each other in the course of a few minutes. It may be mentioned – to give some idea of the magnification – that the size of each film picture is, roughly, ¾ in. by 1 in., and in this space a magnification of 850 diameters is possible. In conclusion, the Cinematograph has become, not – as some people imagine it to be – a showman’s plaything, but a vital necessity for every barracks, ship, college, school, institute, hospital, laboratory, academy and museum; for every traveler, explorer and missionary. In every department of State, science and education, in fact, animated photography is of the greatest importance, and one of the chief and coming means of imparting knowledge.